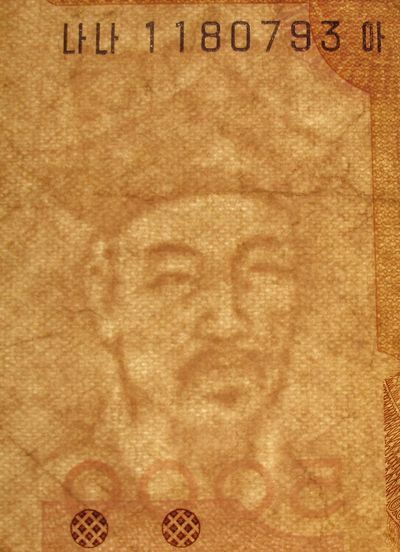 The portrait of Yulgok Yi-I. Yi I (December 26, 1536 - 1584) was one of the two most prominent Korean Confucian scholars of the Joseon Dynasty, the other being his older contemporary, Yi Hwang (Toegye). Yi I is often referred to by his pen name Yulgok ("Chestnut valley"). He is not only known as a scholar, but also as a revered politician and reformer. He was academical successor of Jo Gwang-jo. Yi I was not only known as a philosopher but also as a social reformer. He did not completely agree with the dualistic Neo-Confucianism teachings followed by Yi Hwang. His school of Neo-Confucianism placed emphasis on the more concrete, material elements; rather than inner spiritual perception, this practical and pragmatic approach valued external experience and learning. Unlike Yi Hwang, who suffered through tumultous times and did not enjoy being in politics, Yi I was an active official who thought it important to implement Confucian values and principles to government administration. He emphasized sage learning and self-cultivation as the base of proper administration. Yi I is also well known for his foresight about national security. He proposed to draft and reinforce the army against a possible Japanese attack. His proposal was rejected by the central government, his worry was found to be well-founded soon after his death, during the Imjin war. Denominations in numerals are in top left and lower right corners. Centered in words. Ojukheon is the house where Sin Saimdang lived and the birthplace of the great Neo-Confucian scholar Yulgok Yi-I. This house built Chiyun in the period of King Jungjong (1506-1544). The Ojukheon House (오죽헌) gets its name from the many black bamboo trees (烏竹軒) that surround it. Denominations in numerals are in lower left, lower and top right corners. This banknote I saved for my collection in Seoul, South Korea at 21 May 1999.